My husband and I were reminiscing about desserts that reminded us of our childhood. He was shocked that I’d never had his mom’s favorite, a Lemon Jell-O Cake. I had never even heard of cooking Jell-O into a cake. There is no denying the tastiness of this childhood favorite, but now that we are older, we try to avoid processed and artificially flavored food as much as possible. 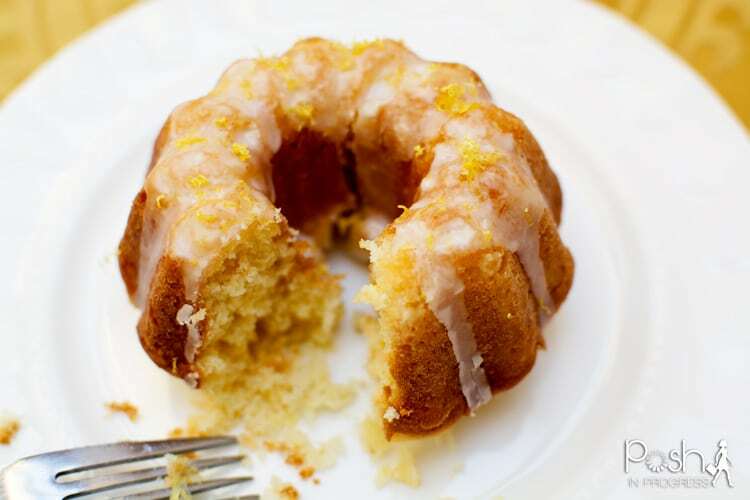 Instead, we decided to find a scratch lemon cake recipe that could rival the lemon Jell-O cake. When I found this recipe, I was sold on the abundant amount of lemon zest and juice it called for. I also liked that this recipe included lemon syrup for moistness and a lemon glaze for extra lemony goodness. These mini Bundt cakes are not only adorable, they are tart but still have a nice amount of sweetness. The lemon really shines in these cakes and they pair perfectly with a cup of hot tea or coffee. Preheat the oven to 350 degrees F. Grease and flour 2 mini Bundt pans. Cream the butter and 2 cups granulated sugar in a bowl until light and fluffy, about 5 minutes. With the mixer on medium speed, add the eggs, 1 at a time and then the lemon zest. Sift together the flour, baking powder, baking soda, and salt in a bowl. In another bowl, combine ¼ cup lemon juice, the milk and vanilla. Add the flour and milk mixtures alternately to the batter beginning and ending with the flour. Divide the batter evenly between the pans, smooth the tops, and bake for 25 to 30 minutes, until a cake tester comes out clean. Combine ½ cup granulated sugar with ½ cup lemon juice in a small saucepan and cook over low heat until the sugar dissolves. When the cakes are done, allow to cool for 10 minutes. Remove the cakes from the pans and set them on a rack set over a tray or sheet pan; spoon the lemon syrup over them. Allow the cakes to cool completely. For the glaze, combine the confectioners’ sugar and the lemon juice in a bowl, mixing with a wire whisk until smooth. Pour over the tops of the cakes and allow the glaze to drizzle down the sides. If desired, add fresh lemon zest to the tops of the cakes.